Three of expansion joint products provide the quality and quantity Fangjiashan Nuclear Power Plant-Nanjing Sanli Rubber Co., Ltd.
CPC Central Committee and the State Council attached great importance to nuclear power development, has recently approved the construction of Ningde, Fuqing, Fujian, Guangdong and Zhejiang Fangjiashan four Yangjiang Nuclear Power Station. New construction and have been approved already built nuclear power is 2.5 times the size of nuclear size. 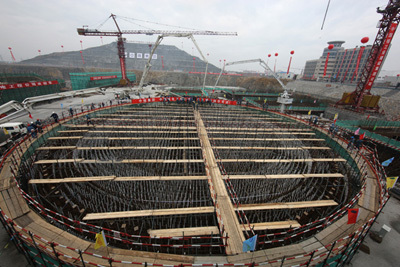 Under the plan, the two nuclear units Fangjiashan project will be held in December 2013 and October 2014 officially put into commercial operation. With the completion of Fangjiashan nuclear power project, Qinshan nuclear power base will become China's largest nuclear power installed capacity base. It marked the start of China's Qinshan nuclear power base first base to achieve a major leap from 300,000 kilowatts to 1 million kilowatts of nuclear power development. With its built 秦山基 places will have nine nuclear power units, installed capacity will reach 6.3 million kilowatts, will become China's installed capacity of the largest and most abundant type Reactor, Nuclear localization of the highest degree, than the most economical nuclear power plant investment Advantages of nuclear power base. Approval and start Fangjiashan nuclear power engineering, is conscientiously implement the State Council embodied on expanding domestic demand and promoting economic growth policy is to implement the State Council to actively promote nuclear power construction strategic decision is another important step. Three of the Nanjing Rubber Co., Ltd. as a former Ministry of Water Resources, Ministry of Water seal only production units and companies such as CNNC excellent supplier from Qinshan one, the Qinshan two, three, to the Tianwan, Daya Bay Ling Ao, etc. for China's nuclear power development has made important contributions. In mid-March 2009, the company projects anxious urgency of the nuclear power plant project, will be the first site for special Fangjiashan rubber expansion joints components deliver victory to win the construction side again - Nuclear second two construction companies in the world.